Founder/Secretary: Shanti Pappu is interested in prehistory, palaeoenvironments, ethnoarchaeology, history of archaeology and in public archaeology, especially for children and teachers. She is a former Professor of Prehistory at the Deccan College Postgraduate & Research Institute. She completed her M.A degree and doctorate from the Deccan College Post-graduate and Research Institute, Pune (1996), under Prof. K.Paddayya, on the prehistoric archaeology of Tamil Nadu, and was subsequently a Homi Bhabha Fellow. She was a Charles Wallace Fellow at the Ancient India and Iran Trust, U.K. She has obtained several awards including the Prof.H.D.Sankalia gold medal from the Deccan College, and Young Scientist award from the Earthwatch Institute, the USA amongst others. She holds a law degree with a dissertation on cultural heritage laws of India and is a registered advocate. She has published two books, with numerous publications in peer-reviewed journals, including Science, and Nature as also one book for children on archaeology and several popular articles. She is currently director of the research project on prehistory and palaeoenvironments in Tamil Nadu, including excavations at the site of Attirampakkam. She is affiliated with several academic bodies and societies, and is Member, Global Library Committee, World Archaeology Congress, the Joint-Secretary of the Indian Society for Prehistoric and Quaternary Studies and former joint editor of the journal Man and Environment. She is on the Board of Management of the Children’s Garden School Society and affiliated schools in Chennai (Ellen Sharma Memorial Matriculation & Higher Secondary School, Sholinganallore) and is involved in educational programs for children and teachers. Read more on publications here. Director: He completed his B.A. degree in Ancient Indian History and Archaeology at the Banaras Hindu University, followed by his Master's Degree in Archaeology at the Deccan College, Pune. His Ph.D. from the Deccan College, Pune, under Prof. V.N. Misra, was on the prehistoric archaeology of Jharkhand, with a focus on investigating Terminal Pleistocene sites of the Upper Palaeolithic. He is currently Co-Director of the research project on prehistory and palaeoenvironments at Attirampakkam and is the Director of the research project on investigating prehistoric sites in Tamil Nadu. Akhilesh is interested in prehistory, experimental archaeology (lithic knapping), satellite remote sensing and GIS. Akhilesh was a Homi Bhabha Fellow (2016-2018).His special interests are in experimental archaeology (reconstructing ancient technology) for which he completed advanced courses in lithic technology from France, under the guidance of Prof. P-J.Texier, J.Pelegrin and other experts in the field. His area of expertise is stone tool technology, and he is currently involved in the analysis of artefacts from Attirampakkam and other sites in Tamil Nadu. He is director of the program on experimental replication of the technologies used by Acheulian and Middle Palaeolithic hominins at Attirampakkam. He is also involved in a project on applications of satellite remote sensing and GIS in archaeology for purposes of research and heritage management. He was responsible for developing thematic maps using satellite remote sensing and field investigation, amongst other studies, under an ISRO-GBP project in collaboration with ISRO (Indian Space Research Organisation)-RRSC (Regional Centre for Remote Sensing)-South. He has numerous research papers in peer-reviewed national and international journals to his credit, including Science and Nature and has presented his work in conferences in India and abroad. He is on the editorial board of the international peer-reviewed journal Archaeological Discovery. 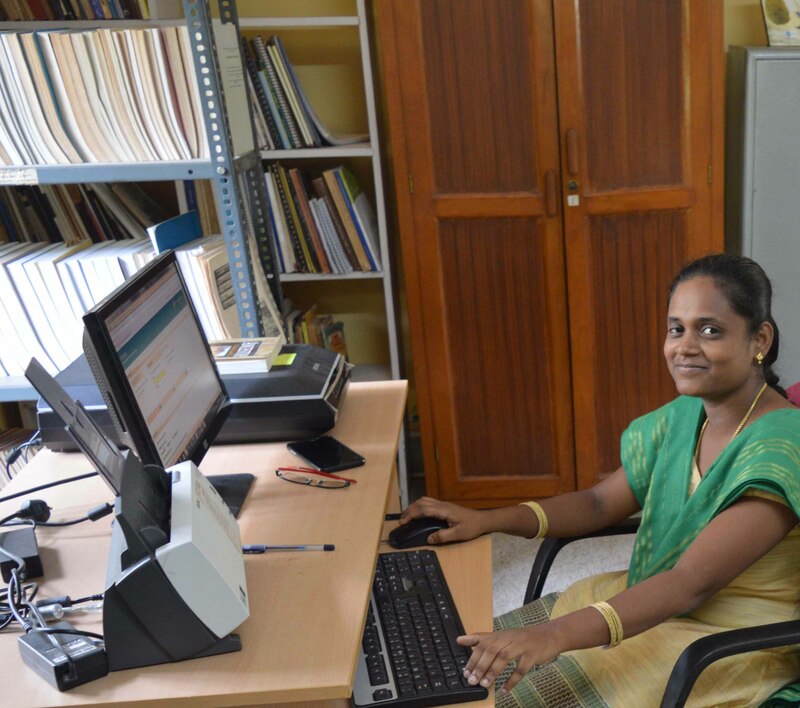 She is a graduate in computer science and is engaged in the Dr. Gudrun Corvinus Memorial Project, in the digitisation of documents as also in public archaeology programs. She is also involved in database management projects.